Displays, created by library staff and community groups, can be found throughout the many areas of the library, drawing attention to national days of remembrance, seasonal holidays, and topics of interest to library users, and highlighting different books and resources. Often found on the escalator landings, framed by the Copier room wall, these displays use familiar materials and presentation techniques to animate the space of the library. Jillian Pritchard and Dan Starling were intrigued by these rotating displays, which might be seen as ‘exhibitions from the collection’. The ‘curator’ of the display chooses works from the VPL holdings, and places them together with lettering, fabric, paper and other materials to lend an interpretation of the published works. Distinguished by their accessible, clear communication, and economy of means, the displays employ the language of art – colour, texture, shape and form – to catch the eye of the library patron. The artists replicated, within their studio, the red wall of the photocopy room and the surrounding area. Having constructed a set, they created twelve displays of their own, and photographed them using a standard camera distance. 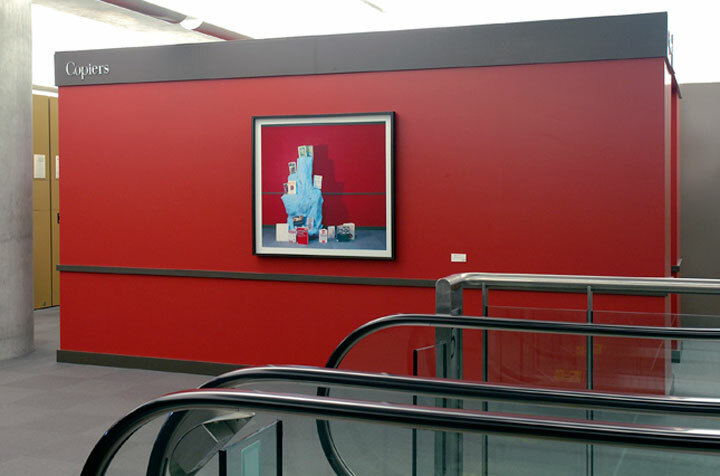 The large-scale photographs were then installed on the red wall in the library, rotating monthly for one year. Twelve Subjects uses the language and materials of display-making to tackle subjects of concern to artists, such as accessibility and meaning, the relationship of form to content, and other issues artists face as they set out to communicate with an audience. Presenting a photograph of the display, rather than their display itself, introduces a critical distance from objects and materials documented, frames the work as ‘art’, and provides a humorous take on the role of the artist in contemporary culture.